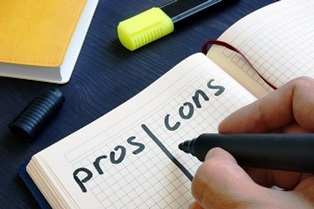 What are the pros and cons of accepting a workers' compensation settlement? If you were hurt on the job or while performing duties within the course and scope of your employment, you may be eligible for workers' compensation benefits, including coverage for reasonable medical expenses and lost wages. Once you've filed a Georgia workers' compensation claim, you may be faced with the decision of whether to accept a settlement or to take your chances in court. PRO: an end to litigation. Litigating a workers' compensation claim in court can be lengthy, expensive, and emotionally grueling. Accepting a settlement allows you to bypass the uncertain trial process and collect a lump sum of money. CON: you may get less than you deserve. Insurance companies and their attorneys know just how frustrating litigating a workers' compensation claim can be, which is why they may offer an unfairly low settlement amount with the hope you'll be tempted to take it. An experienced Georgia workers' compensation attorney can help you determine whether accepting a settlement is in your best interest. While a lump sum may mean having access to more money more quickly, it may not be sufficient to meet your needs if you're suffering from a long-term injury or illness. Additionally, accepting a lump sum settlement can also be problematic if you haven't yet reached maximum medical improvement, as it is sometimes difficult to estimate the amount needed for future medical expenses. Do you have questions about a settling a Georgia workers' compensation case? Contact Rechtman & Spevak today to schedule an appointment for a free initial consultation to discuss the details of your case with a member of our knowledgeable legal team.